Hey everyone, it's Hilary here today with some fun projects featuring the papers & embellishments from Authentique Paper's, "Elegant" line. 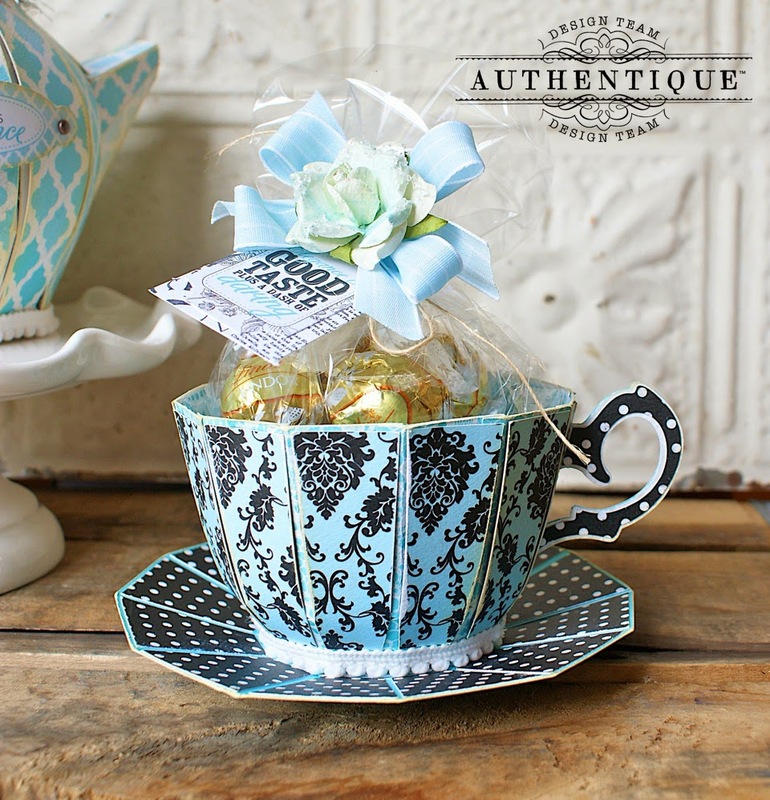 I thought the colors and papers would be perfect for a little tea party, and I used SVG files to create the pieces featured here. All of these pieces were extremely easy to assemble after the files were cut, but when finished they look like they took hours to create and you're left with the sweetest of all teapots, the cutest of teacups and a tea bag dispensary that is the perfect compliment. I hope you enjoy! For those who may not be familiar with SVG files, they are files that are downloaded and electronically cut out through various electronic die cutting machines such as the Sizzix Eclips, (which is what I use), Cricut, Cameo Silhoutte, Pazzles and a few others. They need software such as eCal, Sure Cut's A lot, Silhoutte Studio Designer, and Make-the-Cut. 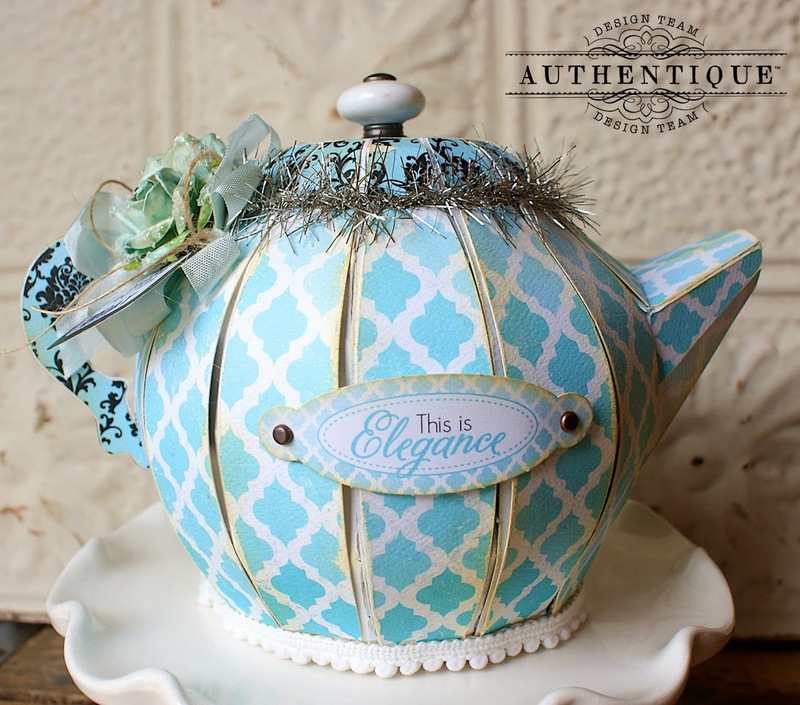 This teapot has to be one of my favorite projects from this line. 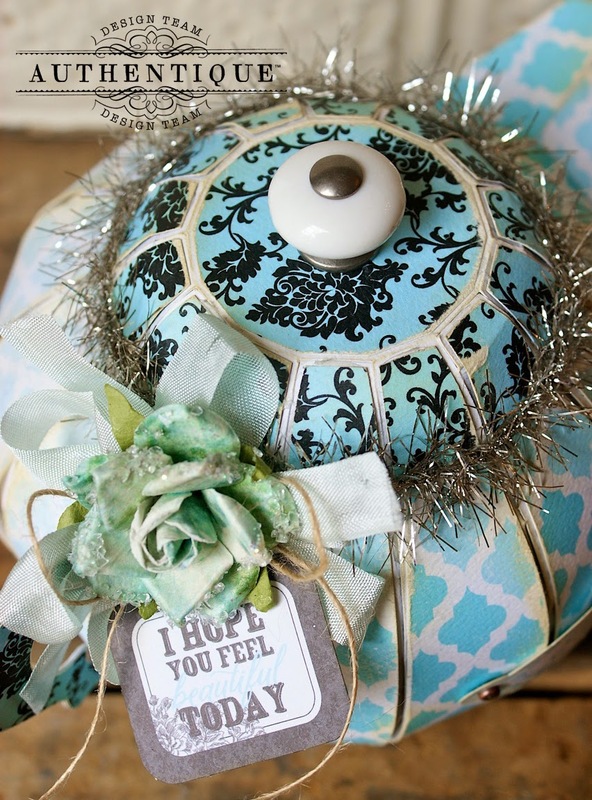 I used the "ten" paper from the "Elegant" line, and I think it was the perfect paper to used for this little teapot. I think this would make an amazing centerpiece at your next tea party. For the top, I used a contrasting pattern paper, (Elegant "five"). I chose to glue my top down, and wrap it with silver tinsel ribbon, but how sweet would this teapot be stuffed with flowers, (fake of course). 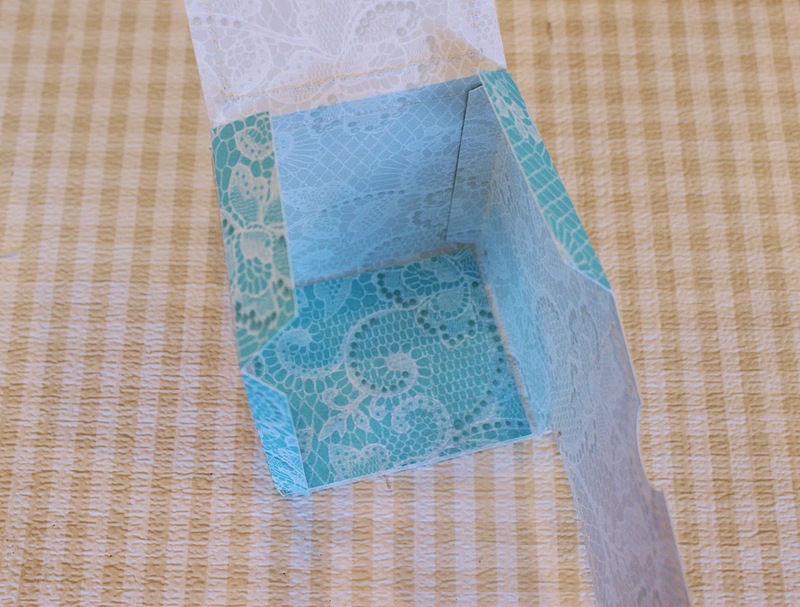 I then finished it with a drawer pull on the top, and a flower, ribbon, and die cut tag from the "Elegant" line. In addition to the tea bag dispensary, I had to include a little teacup as well. 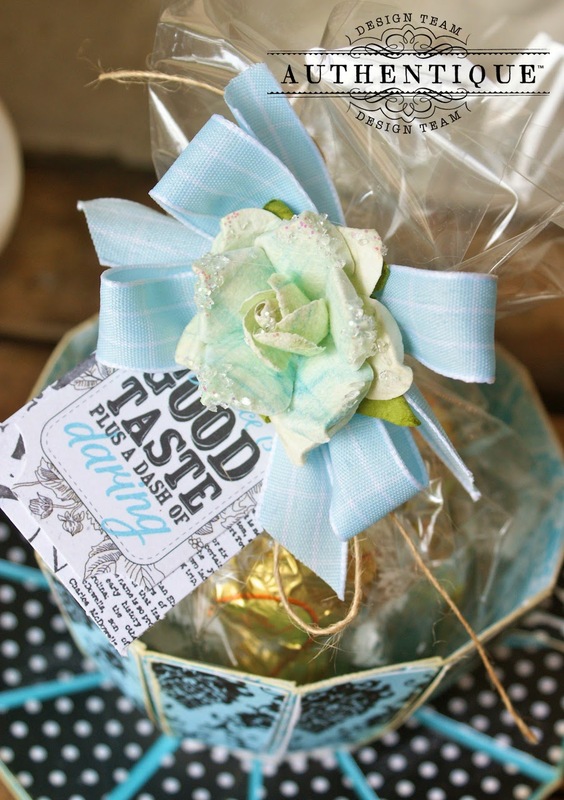 The one pictured here is stuffed with white chocolate truffles, and it would make the perfect gift. I really love how the "five" pattern turns this teacup into one that looks like it's really made from China. This little tea cup is so pretty, I almost wish I could sip from it. For the top of the bag, again I just chose to close the bag with ribbon, a flower and tag. 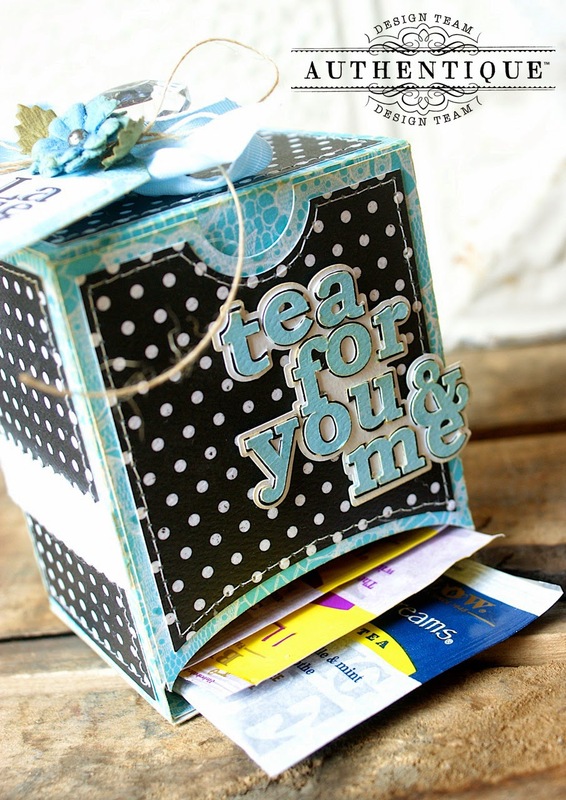 The tea dispensary box, is so sweet. And this was so very simple to make. 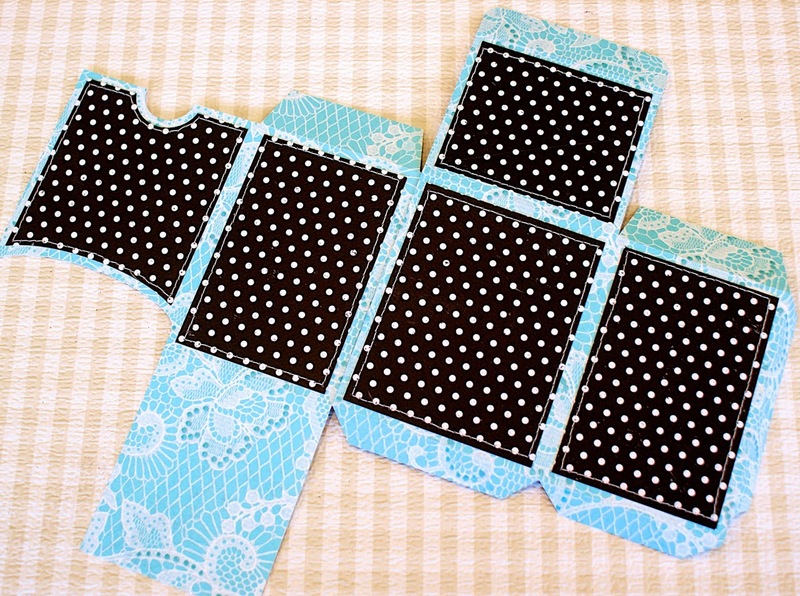 After your electronic cutter cuts out your pieces, it's assembly couldn't be easier. Every piece is scored, so there's no guess work, it's self explanatory. I simply added the black panels and lightly adhered them. 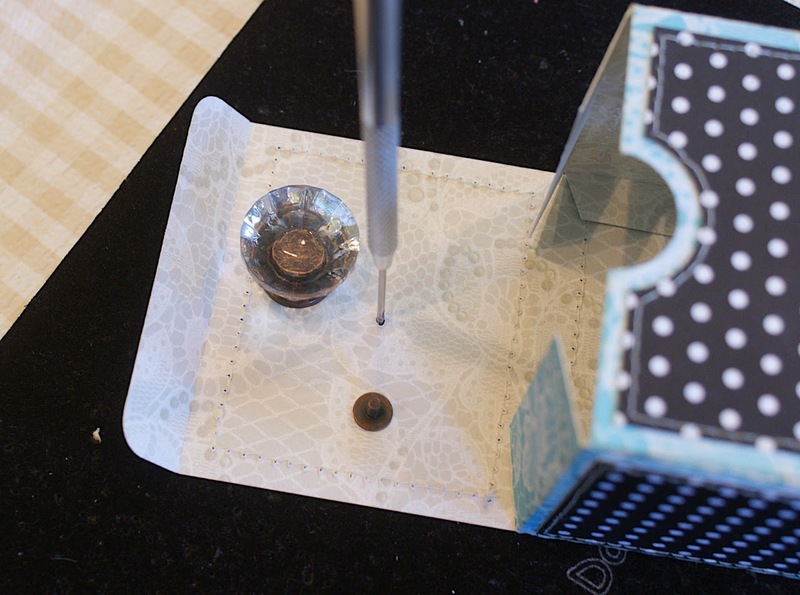 I chose to machine stitch the panels around my box to give it a more handmade look. Plus I have to at least stitch one thing in this collection! lol! Then began to adhere the sides together. The extra piece is added at the bottom before the box is finally closed up and adhered together. By the way, I used small beads of hot glue for my projects today. Especially with altered projects, I like to use an adhesive I know won't fail, and hot glue is my choice. For the top, I chose to add an antique drawer pull. Very simple, just poke a hole and add the drawer pull, tightening until it hand tight. 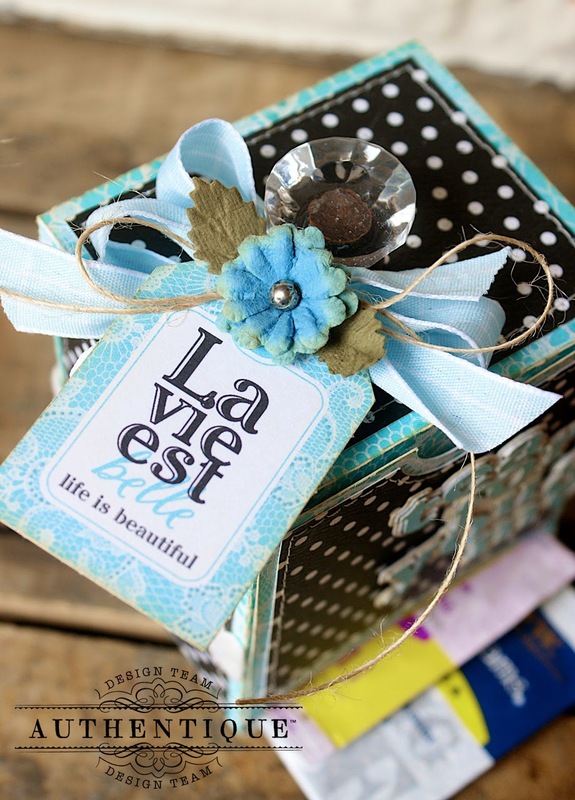 To finish the box, I added another bow, another flower, and a tag from the "Elegant" line. 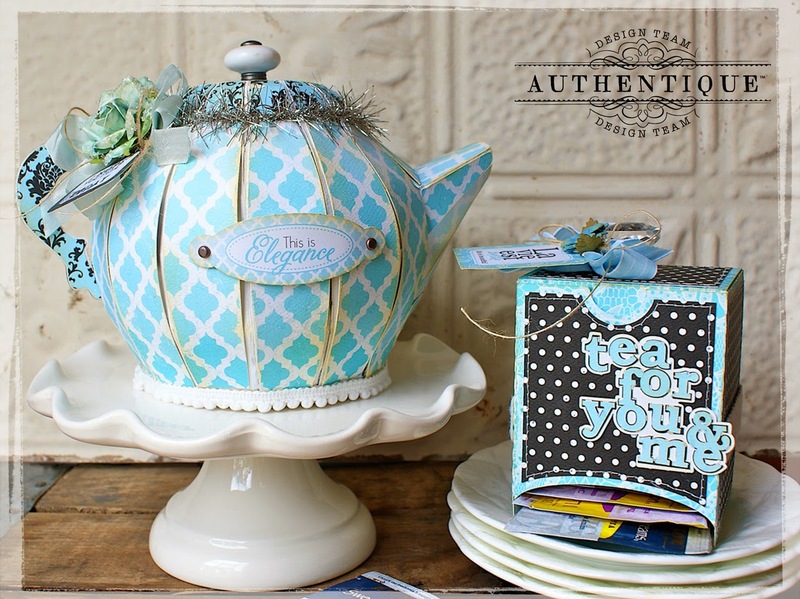 Fill your box with an assortment of tea's and you now have everything you need to throw the sweetest tea party on the block. I hope you enjoy these projects today, and I hope these inspire you to create your own using SVG files. 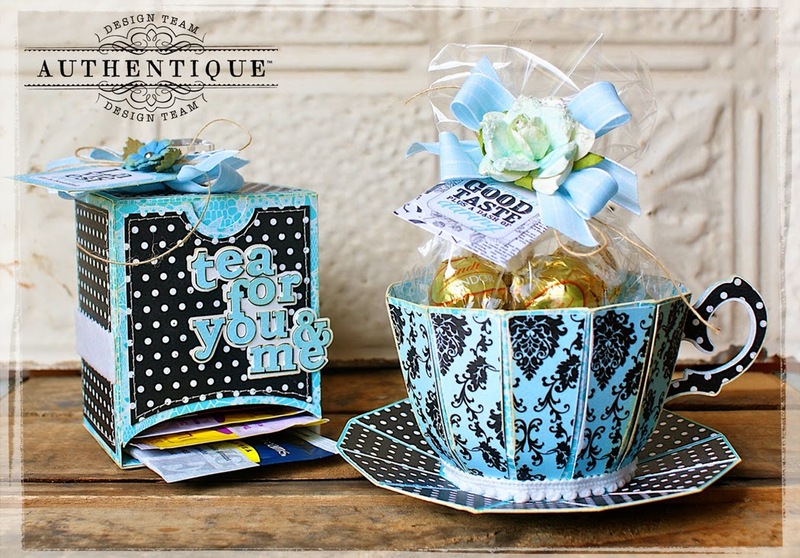 "three", "five", "seven", "ten", "twelve"
SVG files: "Tea for You"
ribbon, antique vintage drawer pulls, (Tim Holtz), twine, flowers, (Petaloo & Prima), distessing ink, (Antique Linen, "Ranger"), silver tinsel ribbon, (Melissa Frances), hole punch, hot glue, Tombow (Power Bond), mini-white pom-pom trim, (bottom of teacup). Such a gorgeous and unique project! I love, love, love it! I'm excited to be part of the upcoming Blog Hop the week of April 7 between Authentique and Top Dog Dies. I stopped by here to check out your blog, and wondered why you don't do any challenges (none since January). I hope you will start again - I'd love to play along. Thank you for the lovely papers (Anchored) we received, and I look forward to hopping with your talented Design Team. I love these projects! My mom just passed away this month and she and I used to always share tea together. Sometimes we went to tea shops or hotels for tea and when Mom was younger, she used to put on the most fabulous teas in her home. Warm scones with clotted cream, savory tiny sandwiches, and the most wonderful sweets - chocolate truffles, small pastry and cookies! Throughout this month I've wished I could share things I see, do, or hear about with Mom, but this post really made me wish she were here to share with her. Thanks for bringing back wonderful memories! 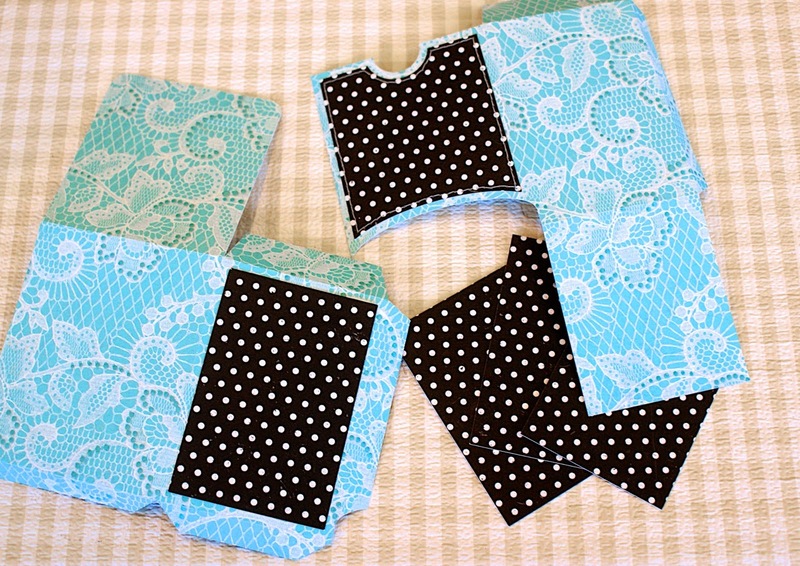 I'd love to try and make these projects? Where do I find the cutting files? If you have time to answer, I'd really appreciate it. I'm thinking I should carry on Mom's tea tradition. Hi Robin, first of all, I'm so sorry to hear about the passing of your mother. Thank you so much for the glimpse into your life and the wonderful memories the two of you had together. She seems like a wonderful mother and the times you had together, I'm sure, left an indelible mark on your heart. I'm so sorry for your loss. I'll try to paste the link here below for you. You do need an electronic cutter such as a Cricut, Cameo or Eclips and eCal software. But once you have those things, the ideas and possibilities are endless. I hope this information helps. Thank you again so much for writing and sharing your mom with us. hugs to you!! that box is just amazing, I want to try. very beautiful!!! Oh, I love your teapot and cup. J'adore ! Je craque complètement pour la théière et la tasse !